We appreciate Pete Peterson’s attention to our work, but in responding to his complaint that we are denigrating Generation X and underrating its civic participation, we should begin at the beginning, define our terms, and give credit where credit is due. In writing our book, Millennial Makeover: MySpace, YouTube, and the Future of American Politics , we borrowed heavily from the thinking of and acknowledged our intellectual debt to Neil Howe and the late William Strauss, the founders of generational theory. In their seminal books, Generations (1992) and The Fourth Turning (1997), Strauss and Howe described the four generational archetypes – Idealist, Reactive, Civic, and Adaptive – that have cycled throughout Anglo-American history. Stemming from the way each generation was reared by its parents, each generational type develops a characteristic set of attitudes and behaviors that is broadly similar regardless of where in American history it appears. It is the attitudes and behaviors of these archetypes, not our biases or disdain for Generation X, that underpin our comments. Those same archetypical attitudes and behaviors also shape the statistics that Peterson cites both selectively and somewhat out of context in his New Geography posting. While the NCOC statistics do indicate that Millennials lead the way in civic engagement, to be fair the overall differences between the X and Millennial Generations are not large. What most distinguishes Millennials from other generations is the type of community activities in which they are involved. Not surprisingly, given the lower incomes normally associated with entry level jobs and the fact that the Great Recession has hit them to a far greater extent than other generations, Millennials are more likely than older generations to volunteer rather than make financial donations. While a plurality of those in all generations say they both volunteer and donate financially, Millennials are substantially more likely to engage solely as volunteers. Among those who only volunteer, Millennials do so at 3.25 times the rate of Baby Boomers, 2.6 times that of seniors, and 1.3 times more than members of Generation X. In effect, at least in the current economy, Millennials have more time than money. As Peterson points out, when respondents were asked whether they had increased their civic participation in the past year, Gen-Xers led the way with 39% answering “yes” surpassing Millennials (29%), Boomers (26%), and seniors (25%). He dismisses the possibility that this might reflect improvements in previously low engagement levels among Gen-Xers, but actually it does. According to the U.S. Department of Education in 1984, when all of them were Gen-Xers, only a quarter (27%) of high school students participated in community service. Twenty years later, when all high school students were Millennials about three times as many (80%) did so. It could be argued that this increase occurred simply because by 2004 students were required to be active in their communities while they weren’t previously. But, for whatever reason, Millennials better seemed to internalize the lessons about community service to which they were exposed in high school. In 1989, 13% of those participating in the National Service organizations like the Peace Corps and Teachers Corps were from Generation X, about the percentage contribution of the generation to the U.S. population at that time. In 2006, 26% of National Service participants were Millennials, twice their percentage in the population. Peterson also maintains the voting turnout of Generation X equals that of Millennials when the two generations were of similar age. To demonstrate this he compares youth turnout in the 1992 and 2008 presidential elections. According to CIRCLE, a non-partisan organization that studies and attempts to increase the political participation of young people, 18-29 years did indeed vote at similar rates in 1992 when those of that age were Gen-Xers (50%) and in 2008 when that age group consisted primarily of Millennials (52% overall and 59% in the competitive battleground states in which the Obama and McCain campaigns concentrated their efforts). What Peterson did not do is to report on what occurred in all of the elections between 1992 and 2008. This provides more nuanced data that is generally more favorable to Millennials. For example, in 1996, when again all young voters were members of Generation X, youth electoral participation fell to 37%, the lowest of any year for which CIRCLE reports data. Youth voting began to steadily increase starting in 2000 as the first Millennials attained voting age until, in 2008, it reached the highest level since 1972. But, Peterson’s biggest unhappiness with those of us who “gush” about the Millennials really seems to be his belief that we extol them for partisan reasons. It is true that Millennials lean heavily to the Democratic Party. They supported Barack Obama against John McCain by a greater than 2:1 margin (66% vs. 32%) and, according to Pew, last October identified as Democrats over Republicans by 52% vs. 34%. They are also the first generation in at least four to contain more self-perceived liberals than conservatives. We certainly don’t hide the fact that we are life-long Democrats, something we clearly pointed out in the introduction to our book even as we made every effort to be evenhanded in our examination of American politics. That evenhanded examination suggests that as a civic generation, at this point in American history, it is hard to imagine most Millennials being anything other than Democrats. Civic generations, like the Millennials, favor societal and governmental solutions to the problems facing America. At least since the New Deal, the Democratic Party has had more affinity for such approaches than the GOP. It is for this reason that the GI Generation (Tom Brokaw’s Greatest Generation) became lifelong Democrats in the 1930s and why we believe most Millennials now see themselves as Democrats and vote that way. For Peterson to wish that were different won’t make it so. But, in the end, all generational archetypes play key roles in the mosaic of American life. In truth, no generation is somehow “better” or “worse” than another. When the civic GI Generation served America so nobly and effectively in World War II, members of the idealist Missionary Generation like Franklin D. Roosevelt inspired it and it was commanded in battle by great generals from the reactive Lost Generation such as Dwight Eisenhower and George Patton. America now faces a new set of grave issues. It will take the concerted efforts of all generations to confront and resolve them. Submitted by nyrstein on Thu, 02/11/2010 - 11:23.
. . .has been attributed to Aristide Briand, Georges Clemenceau, Winston Churchhill, and Bernard Shaw, among others. "N'etre pas republicain a vingt ans est prevue d'un manque de coeur; letre apres trente ans est prevue d'un manque de tete"
-In English: "Not to be a republican at twenty is proof of want of heart; to be one at thirty is proof of want of head"
He supposedly said this when France was deciding whether to be a Republic of the people, or to stay a monarchy (hence "Republican"). We all know what happened with that. Georges Clemenceau is reported to have "borrowed" the quote and changed "republican" to "socialist"--he was around much later than Guizot. This is history--a recycling and changing of facts, until the truth is distorted or lost in obscurity. Who knows if even Guizot said it originally. This is human nature--to misconceive out of our innate selfishness. It's our weakness and also our strength. On a personal note, when I'm volunteering for a project, I'm trying to concentrate at that moment on trying to get food to these particular people or rebuilding those houses devastated by a hurricane (etc). I'm not calculating how I'm part of some nobler collective that is shaming others with our superior virtues. Ok--so maybe when I was younger I would be thinking that I'm impressing the ladies or generating some instant karma (I'm only human). My point is that regardless of your civic activities, make sure your heart and mind are in the right place--which to me is with the people you're helping. 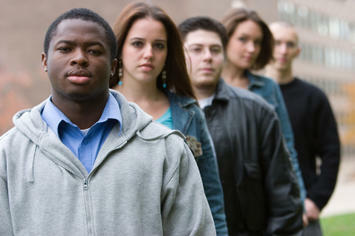 They would appreciate the help from anyone of any age--because all they are worrying about is surviving the next day. Oh, and as far as Georges Clemenceau is concerned, he is quoted as saying, "Oh, to be seventy again!" on his 80th birthday. (but this also could be attributed to Oliver Wendell Holmes, who said something similar.) I enjoy the French sense of aging and living--they tend not to have the same miserable hangups we have with it. Although, I'm sure everyone would like to be 25 forever. Personally, I'm perfectly fine with where I am now. Submitted by millennial makeover on Fri, 02/05/2010 - 17:43. To quote Generation X’s favorite President, Ronald Reagan, “There you go again.” Twisting statistics and ignoring what we have written won’t actually win you any converts to your argument however. And not disclosing your role in helping create NCOC stats that you are touting will lose you major style points with Millennials and Gen Xers, both of whom place a high priority on honesty and transparency. At least our response hit home hard enough to cause you to disclose your partisan bias—something you accused us of not doing, even though we made it clear up front in our book and our response. On the specifics of voter turnout, we have already written extensively on the failure of Democrats to generate enthusiasm among Millennials, as well as other groups comprising the Democratic coalition, in the most recent three state-wide elections. (http://ndn.org/blog/2010/01/three-strikes-and-youre-out) (http://ndn.org/blog/2009/11/four-ms-millennial-politics) (http://ndn.org/blog/2009/11/deeds-done) You, however, failed to mention that, outside of the Virginia gubernatorial election, those Millennials who did vote continued to express their preference for the (losing) Democratic candidates. Then you shifted the conversation to off year elections, but conveniently failed to mention stats from CIRCLE on voter turnout by 18-29 years old in the 1990s. Just for the record, CIRCLE’s data shows youth voter turnout declined as more and more Xers filled this age group. It was 28% in 1990 (made up of almost all Xers and a few remaining young Boomers), 26% in 1994 (completely X) and 22% in 1998 (all X as well). Youth turnout began to rise in 2002 as Millennials entered the 18-29 cohort and went up even further in 2006, by 24%, with Gen Xers almost completely out of the cohort, a fact we painstakingly documented in our book, which you claim to have read. It will continue to go up in 2010—so long as both parties make a legitimate attempt to appeal to members of this generation. The recent referendum election in Oregon that approved an historic increase in taxes to support that state’s educational programs is just the latest example of Millennials continuing to participate in elections in which they feel they have a stake. You then make a startling error in your response to our statistics on civic engagement among Millennials compared to Xers. In our statement about participation in National Service, we were referring to the percentage of ALL volunteers who were 16-24 at two points in time. The increase in the Millennial Generation’s percentage of participation compared to all other generations has nothing to do with the number of available slots. It could have been a thousand, a million, or ten million and the percentages would have been the same. And remember those folks were VOLUNTEERS, and not draftees, so your hostility to the idea that high schools “require” volunteerism is not relevant to the data you attempted to dismiss. Submitted by Pete Peterson on Sun, 02/07/2010 - 01:08. 2. The main point of my original piece was to question a pair of memes, furthered by not only you two, but also folks like Putnam and Teixiera, others, that: a) X'ers are uniquely disengaged from the "civic sphere" - defined for our purposes as tasks from voting to volunteering to giving b) Millennials are uniquely engaged - a "new Greatest Generation", says Putnam. I compare the '92 and '08 elections as it provides the closest point of comparison between the two generations. Using your age brackets to define X and Millennial, the '92 election had 10 years of X'ers participating, while the '08 election had 9 years of Millennials participating. Given all the aforementioned plaudits the Millennials received during the '08 election cycle, I stand by my premise that most Americans would be surprised to learn that there is no statistical difference (less than 1%) in youth turnout between the HWBush/Clinton/Perot race and the Obama/McCain race. It certainly isn't the mantra that we see repeated in the aforementioned paeans. Please go back and read your original missive...You were the ones to move the question on to off-year elections. These, historically, have had lower voter turnouts across all generations. I am happy to concede - and have not denied - that X turnout dropped through the 90s (now rebounding in the 00s), but given the aging of the Millennial population we do not have a comparable off-year election with which to compare. That will happen this November when we will have 11 years worth of Millennials to compare with the 12 years worth of Xers who voted in the '94 election. Data shows that around 20% of Xers voted in that race, and again, here and now, I'm willing to bet that Millennial turnout this November will not be significantly different from this. We have already seen sub-20% Millennial turnout in the last few elections. Very simply, will you take this bet? A final point on voting patterns, I agree with the data, and said so in my response, which apparently you didn't read, that ideologically, Millennials trend liberal. My purpose for stating the response data from the Virginia race is to show that this might not be as iron-clad support as many Dems have posited. 3. On volunteering, you do not challenge any of my assertions that are based on the NCOC study. But let me see if I get your point: the data on volunteering you have is so precise that it can decipher whether someone is "VOLUNTEERING" out of civic-mindedness or "volunteering" because of the recent phenomena of high school/college requirements? Now if you've got that data I'd like to see it. Then we can have a conversation that compares apples (patterns in 1984 when these...uh...inducements were not present) to apples (patterns in 2006 when they are). I don't have a real "hostility" towards these programs other than comparing eras that have them with ones that don't. I can be convinced that the growth in National Service (note: you capitalize this term, so I had thought this was related to volunteer opportunities provided by the Corp for National and Community Serivce?) numbers is due to "supply" than "demand", but I remain skeptical as to the reasons for this supply. Mandated "service-learning" in high school and college, along with the higher levels of competition for college admission are too historically significant factors to be discounted. On a Federal level, President Obama has proposed requiring 100 hour of service in college as part of his "American Opportunity Tax Credit"...they didn't have that around when we were kids. The Peace Corps and AmeriCorps have also had their funding increased by between 10%-20%, increasing the number of slots available to applicants by the 10's of thousands. You don't think this will uniquely and positively impact the levels of "volunteering" by Millennials? The recently passed "Serve America Act" promises to increase the number of Americorps (or, if this were the President speaking, Americorpse) members to 250,000 by 2017. $4million was allocated for a "Generation Volunteer Fund" to "improve volunteer recruitment efforts"...not around when we were their age. 4. I never accused you or others of hiding your liberal leaning. We all know where you stand on that. The point I raise quite clearly is: would we be seeing such a volume of reportage and laudatory coverage of the Millennials' supposed great civic engagement if they were Conservative? Obviously, my answer is no - about which we can disagree - but my links to folks like Teixeira and Connery demonstrate that I understand their partisanship. Also, I'm not hiding my generational status nor my ideology, but the questions I'm raising concern whether a liberal-leaning becomes a liberal bias, unsupported by facts. I have proven here that there is reason to suspect the veracity of claims made by you and others, which support your previously stated political positions. Still, I encourage you to keep going with this "new Greatest Generation" thing...I know the kids love it. Submitted by Pete Peterson on Thu, 02/04/2010 - 17:09. 1. W&H agree that in similarly situated Presidential elections (1992 and 2008) there is little difference in turnout between Millennials and X'ers. They then posit, "What Peterson did not do is to report on what occurred in all of the elections between 1992 and 2008." I thought my purpose was clear that I was comparing similar age turnouts in Presidential races. To get a similar representation of cohorts to compare Millennials and X'ers the '92 and '08 races is the only one that qualifies. To wonder about off-year and other presidential races between '92 and '08 would both over-represent X'ers and under-represent Millennials as a cohort. To get a similarly situated off-year race to compare we will have to wait until this November. And I'm willing here and now to bet an iTunes download (Culture Club vs. CCR, perhaps?) that the X'er vote in '94 will outpace the Millennial vote in 2010. 1. Youth (ages 18-29) turnout in MA: 15% (half of their 2008 level) and less than a third of the age 30+ turnout. Levine's temporary conclusion: "There is clearly an issue right now with youth turnout and enthusiasm." I've read W&H's writing on the importance of the "4 M's" (messenger, message, media, money)...maybe they should add a fifth: Massachusetts. It is definitely too early to tell, but these recent elections raise the possibility that much of the hype around Millennial voting has been founded upon a most unique candidate - something that will be difficult, if not impossible to replicate. 2. On "civic engagement" as a volunteering activity, I stand closely behind the NCOC research. In full disclosure, I served on the advisory group that assembled the questions and survey data, and wrote a chapter along with the introduction of the California edition of the national study. In my essay, I make the point that X'ers increased their civic engagement more than any other cohort. W&H respond: "He dismisses the possibility that this might reflect improvements in previously low engagement levels among Gen-Xers, but actually it does." W&H go on to look at other research, but to keep the discussion within the NCOC survey the so-called "low engagement levels" are just not demonstrated. On volunteering alone, to the question, "Did you volunteer in the previous year? ", 43% of Millennials responded "yes", followed by X'ers at 42.6%. Looking at "civic engagement" more broadly, including other types of "helping activity" like donating food, money, shelter, X'ers overtake Millennials. To compare cohort civic engagement behavior, while interesting, misses an enormous elephant in the room: we live in an age when youth civic engagement has become oxymoronic - it is both funded at higher levels than ever before, and required at higher levels than ever before. To compare X'er volunteering from 1984 with today is ridiculous when we see cities/school districts like those in Washington, DC, Seattle, and Chicago demand "community service" and/or "service learning" as a requirement for graduation, and hundreds if not thousands of other school districts have imposed the same requisites. 1984 indeed! Orwell, would have been amazed at this doublespeak definition of "volunteering". When I was in high school (way back in the 80s), volunteering was something one did out of benevolence or, frankly more often, to improve a college transcript. Now it's required, yet no mention by W&H about this state of affairs. At the same time, W&H cite volunteering data in National Service organizations. They should know that these numbers are more often dependent on the budgets allocated for them not the desire to volunteer. For example, designate a $1million to the Peace Corps, get 100 volunteers, designate $2million, get 200 volunteers...has actual volunteering doubled, or did we just budget more money? Obama's 2010 budget increases funding for National Service programs by 20% - I hope W&H don't come back to us next year to say that Millennials are volunteering at 20% higher rates than previous generations just because of their civic-mindedness. But still, W&H are right. I am making a larger point - one about rhetoric and public opinion. Given the data in relative voting data and volunteering, I think most would surprised at how unremarkable the Millennials have performed given all the reportage and "environmental" support. I do think, in part, this is because of their general (and the data definitely shows this) ideological leaning. I do not think the amount of coverage this generation has received regarding their "civic engagement" would be as great had their partisanship been more right-of-center. We should circle back after the 2010 race to get a clearer sense of where Millennials actually stand. Maybe they'll just "mature" out of their liberal leaning. As the great French statesman, Georges Clemenceau, replied when asked if his son was a Communist: "My son is 22 years old. If he had not become a Communist at 22, I would have disowned him. If he is still a Communist at 30, I will do it then."